(July 29, 2015 Santa Barbara, CA) – Have you seen and read this article on Applications of nanoscale IR spectroscopy by researchers at the Universities of Delaware and Paris? This in-depth review of AFM-IR technology was published as a Focal Point article in Applied Spectroscopy. Originally appearing in the December 2012 issue, this article was downloaded 763 times in the first 6 months of 2015, ranking it second among the top downloaded papers as tracked on the Journal’s website. This high and sustained level of interest reflects the scientific FTIR community’s demand for molecular spectroscopic data at high spatial resolution to characterize the nature of nanoscale domains that so frequently influence the function and performance of synthetic and biological materials. It was also a top downloaded publication in 2014. AFM-IR moves infrared microscopy and chemical imaging into a spatial resolution regime well past the diffraction limit of both conventional infrared and Raman microscopes through use of an integrated atomic force microscope as a near-field detector. On thin films, sub-50 nm resolution has been achieved. Anasys Instruments has recently advanced nanoscale IR Spectroscopy by introducing the nanoIR2-s™ spectrometer which combines AFM-IR with s-SNOM technology. This expands the nanoscale IR platform from Anasys to applications such as Graphene, 2D materials and Photonics in addition to the other more common applications such as . 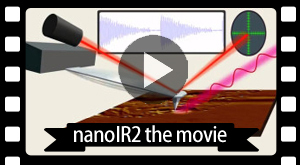 To learn more about the nanoIR2-s, and nanoscale spectroscopy applications, view the details at https://www.anasysinstruments.com/nanoir2s/ .